In talking with users of the Tympan, data logging is something that they'd like the Tympan to do. Furthermore, for the data logging to be useful, the data needs to be time stamped. So, the Tympan needs to know the time and date. Normally, one needs to add a dedicated real-time clock (RTC) circuit for a device to know the time and date. Luckily, the Teensy 3.6 that is at the heart of the Tympan has most of the required elements already built in. Let's finish it off to make it work! My Tympan with the RTC mod. The red wire is the only indication that it has been modified. What is a RTC? A real-time clock is a circuit that keeps time despite the device itself being turned on or off. The RTC works because it is usually provided its own power via a small coin cell battery. The Teensy 3.6 includes all the components that we need except for this battery. Normally, you could simply connect a coin cell and you would be done. Use our LiPo Battery Instead of a Coin Cell. For Tympan, I don't want to try to squeeze a coin cell battery into the Tympan's enclosure. We already have a perfectly good battery in the system (the LiPo battery that powers the whole device). Can't we use that battery for the RTC, too? I think that we can. Providing Power, Even When "Off". There are two tricks to using the LiPo battery. First, we need to bring the LiPo power to the RTC circuit on the Teensy even when the Tympan's power switch is set to "off". In other words, we have to be choosy about where we grab the LiPo power when we bring it to the RTC. Second, before we connect the LiPo to the RTC, we need to step down the LiPo voltage (3.7-4.2V) so that it won't damage the RTC (< 3.6V). The red arrows show the many choices for where to grap the LiPo power for the Teensy's RTC. I chose to grab the LiPo power from the Fuse F1, as shown by the heavy red arrow. Choosing the Connection Point. The figure above is an excerpt from the Tympan schematic (full schematic here). It shows the elements of the circuit related to the LiPo battery (BT1) and the power swtich (SW1). 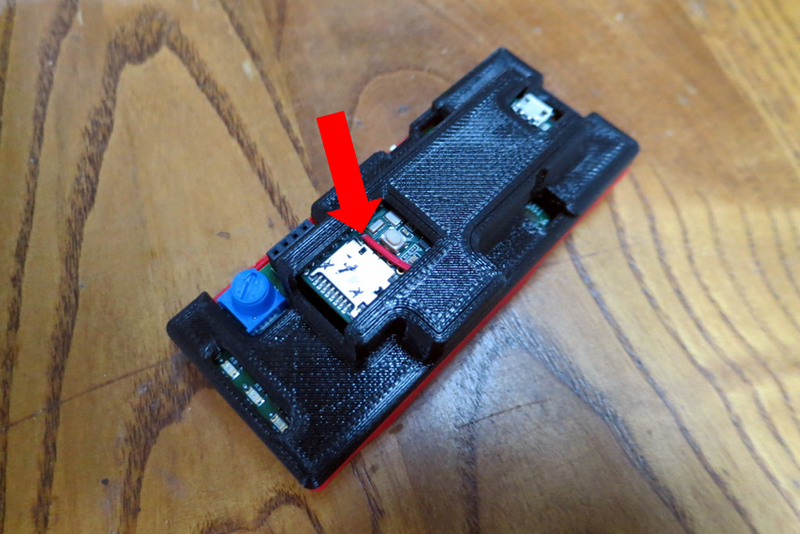 I added red arrows to show all the locations that we could grab the LiPo battery voltage prior to the power switch. Any of these will work. The specific place that we chose will be driven by which spot is easiest to reach with a soldering iron. Stepping Down the Voltage. After choosing place to grab the LiPo power, we need to step down its voltage to a safe level. One can use a variety of techniques. 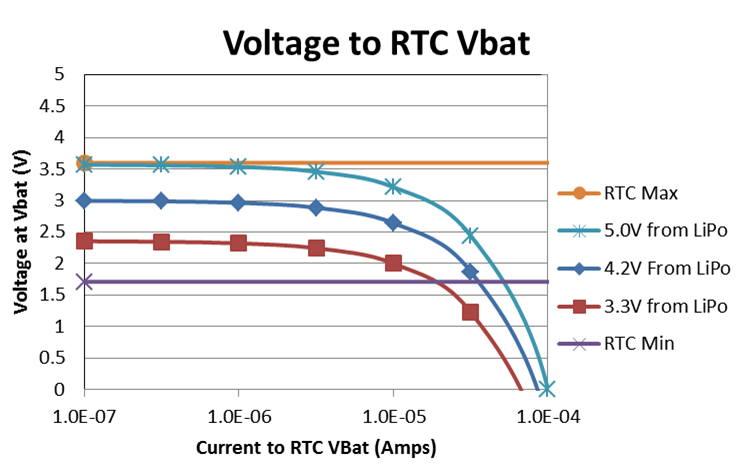 Since the current draw for the RTC is very, very low (about a microamp? ), I chose to use a simple voltage divider. Designing the Voltage Divider. According to the datasheet for the Teensy' microprocessor, the voltage at the RTC battery pin needs to be between 1.71V and 3.6V. We need to step down the LiPo voltage to say within these bounds. To decide what resistor values to use, I am going to assume that the LiPo can go down to 3.3V and maybe as high as 5V (which would only happen if I were to make a wiring mistake while hacking). Given these limits, I chose to use a 50K resistor (high side) and a 125K resistor (low side). As can be seen in the graph below, these resistor values mean that the voltage will be good for any RTC current draw up to 10-50 microamps. Looks great! Wire it Up. Given this voltage divider design, the picture below shows what I did. I chose to grab the LiPo voltage by soldering the 50K resistor to side of the fuse F1. I chose to grab ground by soldering the 125K resistor to TP2 (which is ground). 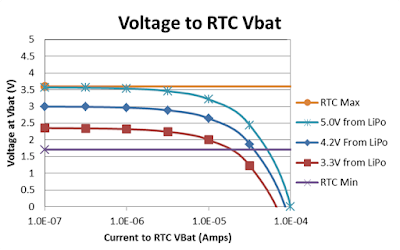 The RTC VBat is taken from the midpoint between the two resistors. I soldered a short red wire from the mid point up to the hole on the Teensy for the RTC VBat. Because these modifications are so small, the modified Tympan fit back into its enclosure without any issues (as shown in the photo at the top of this post). Testing the RTC. To test the real time clock, I used one of the Teensy example programs. 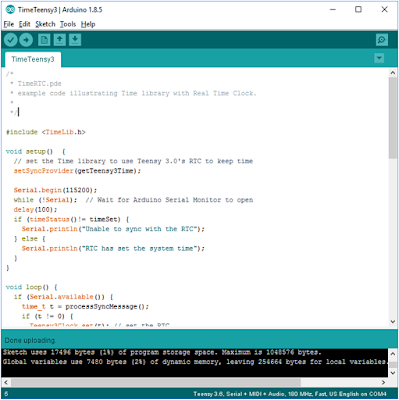 The RTC example programs are part of the "Time" library that comes with the Teensysduino installer. If you didn't install the Time library, go back and re-install Teensyduino and you should be good. The specific example program that I used was "TimeTeensy3". I made no modifications to the program. 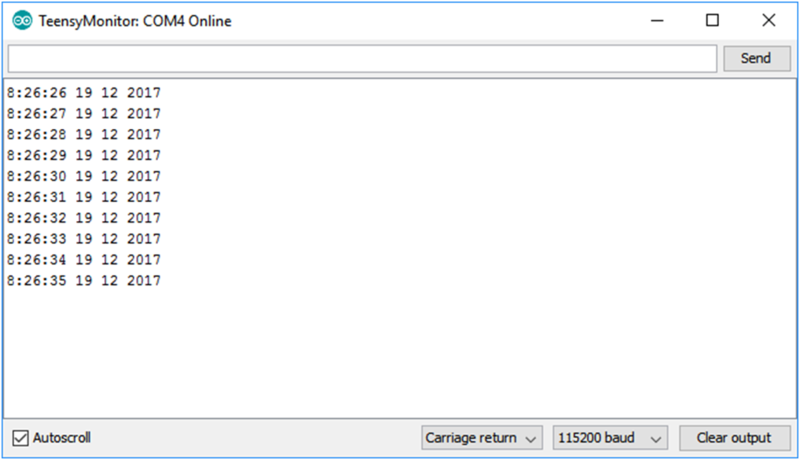 It compiled and uploaded to the Tympan without any issues. To test the RTC on the Tympan, I used the "TimeTeensy3" example program that was made for the Teensy. It works! The example program is set to simply print the Teeny's time and date to the serial port. it does this once a second. By opening the Arduino Serial Monitor, you can see the time and date from the Tympan. It is correct! I then unplugged the Tympan, turned the Tympan power switch to the off position. Normally, this loss of power would cause the Tympan to lose track of time. On my newly-modified Tympan, the RTC should still be getting power from the LiPo battery via the voltage divider. After a few minutes, I turned the Tympan back on and opened up the Serial Monitor. The Tympan was still showing the correct time and date. It works! 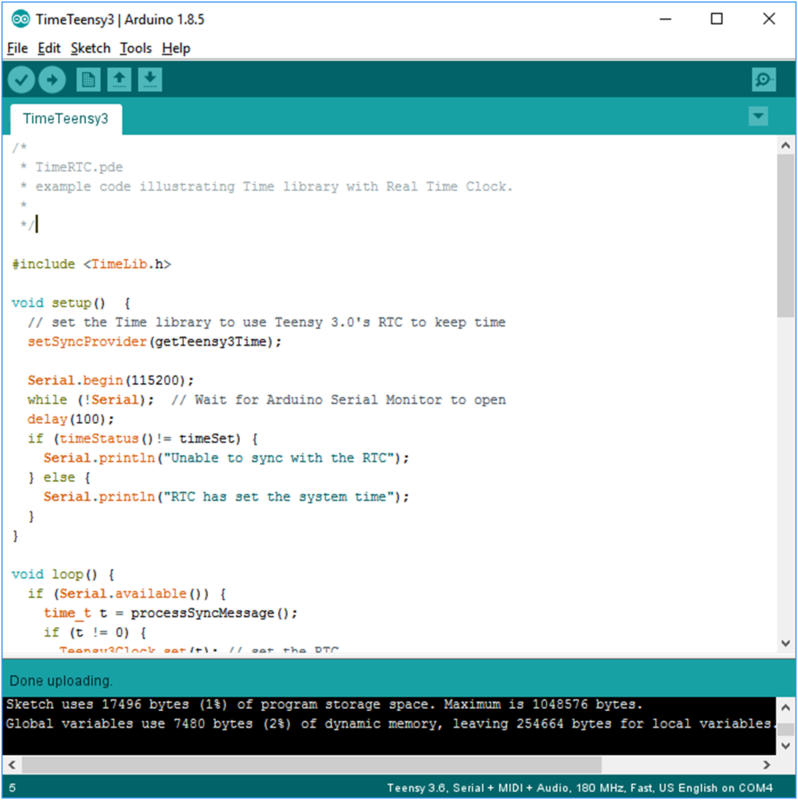 The "TimeTeensy3" example program commands the Teensy to print out the RTCs understanding of the time and date. This output can be viewed through the Arduino Serial Monitor. It works! Even after cycling the Tympan's power, it still works! 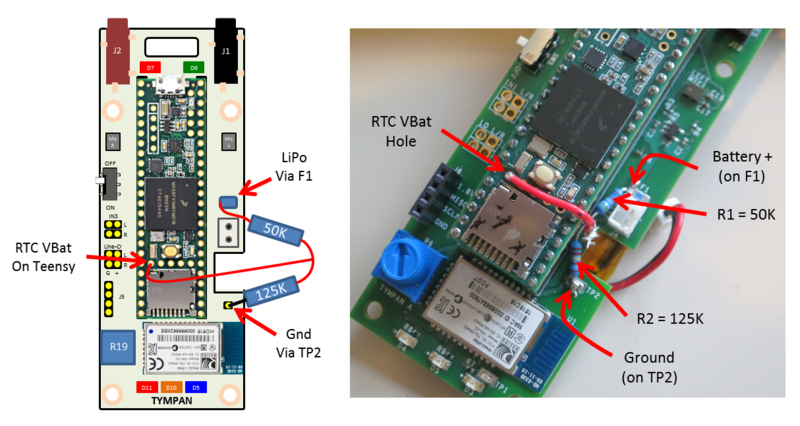 How Does RTC Work on the Teensy? As far as I can tell, the RTC on the Teensy is simply a counter. It simply counts the oscillations of a quartz crystal (or whatever). The Teensy knows how many counts occur every second, so it does not the time relative to when the RTC started counting. But when did the RTC start counting? What is the reference time? For the Teensy Time library, the reference time is taken to be the time and date when the sketch was compiled. The library gets the computer's system time and incorporates that into the program. 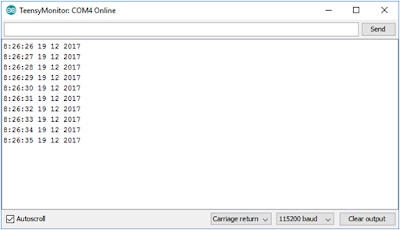 Since the RTC is reset just after compilation is complete, the compile time is a decent approximation for the reference time. No special action from the user is needed. This is a pretty nice setup. Losing RTC Power, The only problem with this setup is if the RTC counter loses power. In my case, this would happen if the LiPo becomes fully drained. When the RTC counter loses power, it loses its count. When power is restored, the RTC will start counting again from zero. The reference time, however, will not have been reset. So, when we ask the RTC what time it is, it'll use the original reference time and we'll get the wrong answer. So, if the LiPo becomes fully discharged, you'll want to reset the RTC by recompiling and re-uploading the program, or by looking at the Time library to figure out how to manually set the time. Overall, I was impressed at how easy it was to get the RTC working on this system. A couple of resistors and a piece of wire? Easy! Now that the Tympan knows the time and date, it'll be much more useful as data logging device. For future users of Tympan, I'm looking forward to incorporating this modification. But, for those of you with the current version of Tympan (Rev C), you'll have to get out the soldering iron. Maybe you're like me and find that to be a fun thing to do!